If there’s a moment in the life of a teacher when they realize it was all worth it, I’ve had mine. The image of a dozen chicken-legged 12-year olds, giggling and shuffling on stage in their nice skirts and slacks is seared into my mind as permanently as the feeling that came with it. Typical in the Czech Republic is the tradition of an end-of-year Open House at the school. They call it the “academy” or – the official title – the Garden Party. It consists of the sale of homemade baked goods from wooden stalls around the school’s lawn, blow-up houses and trampolines for younger kids, and a 3-hour run of performances on a grand stage brought in especially for the occasion. The affair begins at four o’clock and doesn’t end until nearly 9:30 p.m. when the only people left outside are the cleaning crews, putting away the aftermath in the dim glow of the lingering summer twilight. This year, as was the case last year, I ran around taking pictures of students and performers. I sampled the original Czech desserts. I teased my kids and met their parents. I watched the light stretch across the sky until it was so thin you could barely see the blue hues in the milky evening. When the 9th graders did their closing songs, I watched, enraptured with the rest of the several hundred parents, teachers, siblings and friends that had gathered. When they sent their balloons soaring into the sky, like last year, I found myself wiping away tears. But for me, the real moment happened much earlier in the day. Arguably my best and worst classes this year have been with my sixth graders. I didn’t teach any of them last year, so we started fresh in September. It’s been a long year getting to know each other and I’ve learned a lot in the last nine months – not the least of which is that teachers make mistakes too, love is given freely but respect must be earned, and if you try to wake a sleeping 12-year old during first period he will turn into a bear and eat anyone within a two foot radius. A large reason why I’ve loved teaching sixth grade this year is because they loved me first. For reasons I still don’t fully understand, about half of each sixth grade class adopted me as their leader, mentor and mascot. I can’t pass any of them in the hallway without being asked for a high five, no matter how large their group is or how much of a rush we’re in – it takes a while to get anywhere in school these days. But there are those I had to work on. The pair of girls in the back who were far too cool for school. The boys who were always on their phones. The kid who didn’t know that chairs were for sitting in and not for dancing on. The unfortunate few who didn’t believe I was serious when I said I’d send them home with notes to their parents if they didn’t behave. I’ve tried several times this year to write about my sixth graders, but, to be honest, it’s been too painful. Mostly because I’ve made a lot of mistakes with them. Who knew being a teacher wasn’t all black and white? Learning that really loving your students means really disciplining them was hard. Learning that not everyone is going to see you as the good guy was hard. Learning how easy it is to fall off someone’s pedestal was so, so hard. Learning that I have a long way to go as a teacher was discouraging and hard. And I just didn’t know how to put it on the blog. There was no real story. Just me screwing up a lot and my students struggling to grow up, as we all do. But I also learned – miraculously and completely by accident – that my students love to sing. We went over it several times before I suggested, off-handedly, that we do it for the Garden Party. The Vice Head had asked me to prepare something and I needed to come through. I’m not much of a singer, and even less of a director, but this was all I had. At first, only the members of my ‘fan club’ were at all interested, even though most of the class seemed to like the song. Getting up in front of gobs of people to sing it. . . Whole different story. But as the weeks drew nearer and we continued to practice and plan, more and more of my students asked to join our growing choir. By the time the General Practice rolled around, the Friday before the Garden Party, we had maybe a dozen willing participants. The whole school had gathered in the gym and sat on mats or leaned against walls (depending mostly upon whether or not you were a cool upperclassman). The other performances were dance routines or instrumental numbers. Anyone singing was singing along with a CD. Pharrell Williams and Katy Perry were among the many voices that aided our students in their acts. So my students were understandably nervous when they shuffled to the front. They were singing to a karaoke recording. I promised to sit right in front and keep time for them, mouthing the lyrics in case they got lost (which they did, despite the print-outs they were all holding), and guiding them through the difficult music changes. It was rough. Aside from the general disorder and the fact that half of them forgot the second verse and just resang the first one, a stage helper passed them a microphone halfway through the song. That mic got handed down from one to the next – each as surprised and scared of singing that close to it as the previous pair of hands. When it reached the end of the row, a timid blonde girl, realizing she had no one to pass it on to, turned and tried to give it back. No one wanted the mic. This game of hot-potato had the entire gym laughing at us as we sheepishly finished and the music faded out. That was a wake-up call. We need to get our act together. And together we got it. In the next four days, we rehearsed with vigor, planned our costumes, and reviewed our strategy in case someone forgot the words. By our last practice, they were so good they didn’t even really need me up in the front. The day of the Garden Party, classes were sent outside for a run-through. The sun was shining and the breeze was soft as a feather, brushing across our bare faces and tousled hair. The stage on the lawn outside had been set up that morning and my students were now waiting in the tents just to one side. I surveyed the area. Long benches had been set up below the stage for people to sit on. Right now they were filled with the fourth and fifth grade classes. A sound booth was behind them and farther back, between us and the school, was a field of booths being constructed for the bake sale. Various teachers and older students lingered around the ongoing activities. I wandered toward the front of the benches, trying to find a good place to direct my students from. I hadn’t expected to feel so conspicuous standing up in the front, especially with all the younger kids sitting down right behind me. I’m not a choir director anyway, so I felt out of place in a million ways. Despite my rather out-going nature, I don’t like to make a public spectacle of myself. Picking a spot on the grass, I curled up next to a fourth grader and waited for my students to come on. I’d just stay here. They knew the song by now anyway. 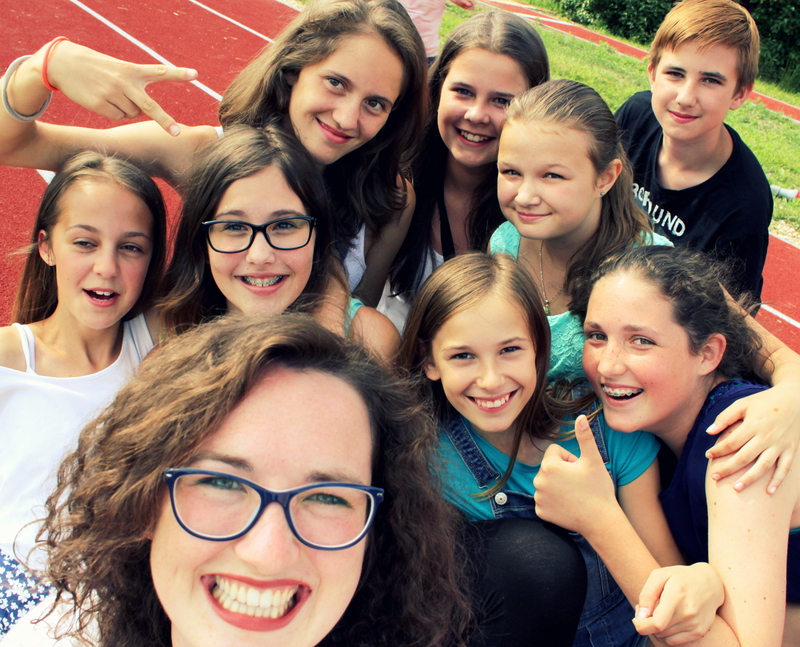 How can it be possible that I’ve grown up as much as my students have? The microphones picked up every giggle and cough as my kids made their way shyly to the front of the stage. They had to be coaxed by the sound guy to come closer to the microphones standing near the edge. Tugging at skirt hems and wringing hands, still giggling awkwardly, my sixth graders tuned their ears for the opening chords of our song. And then I noticed something. The girls in the front were scanning the crowd. The same girls who were once some of my biggest trouble-makers were standing there in their blue-n-white dresses, soft grins on their faces, ready to sing. And looking for me. That was it. That was the moment. That was all I needed to hear to get me to my feet and stand in front of all the teachers and students. My kids needed me. We were a team. They were for me and I was for them. They were willing to sing because I asked them to. I was willing to direct because they needed me to. Every key change, every new verse, they’d look at me with anxious, trusting eyes, and I’d guide them through it, exaggerating the words with my mouth, ignoring the chuckles and grins from those behind us. And when we’d get through a tough spot in the song, I’d smile reassuringly and they’d smile right back. It was the most beautiful tag-teaming I have ever witnessed. And it was us. The actual performance went even better. They were angels. And so many people were standing in the crowd that I didn’t feel in the way when I took my place below the stage. She means I’m going away. I couldn’t help but feel like they’re the balloons. Drifting out of my life as quickly as they came into it. We watched the colorful spots get smaller and smaller and it felt like the whole year had gone by in a blink. But how can that be true when we’re all such different people than we were when it started? How can it be possible that I’ve grown up as much as my students have, that I’ve learned as much – if not more – from them as they’ve learned from me? And how can it all be over so soon? I want to tell my students that I’ll always be there for them. That if they ask where I am, I’ll be able to stand up and guide them through whatever they’re struggling with. But I can’t. Because I’m flying away. More of my sixth graders found us and we stood in silence under the vanishing flecks of color. And I wondered how the balloons felt to be leaving. Were they scared to rise to such great heights, so far away from where they started? Did they worry about being separated from the other balloons? Or were they simply happy to be free, going on their merry way? 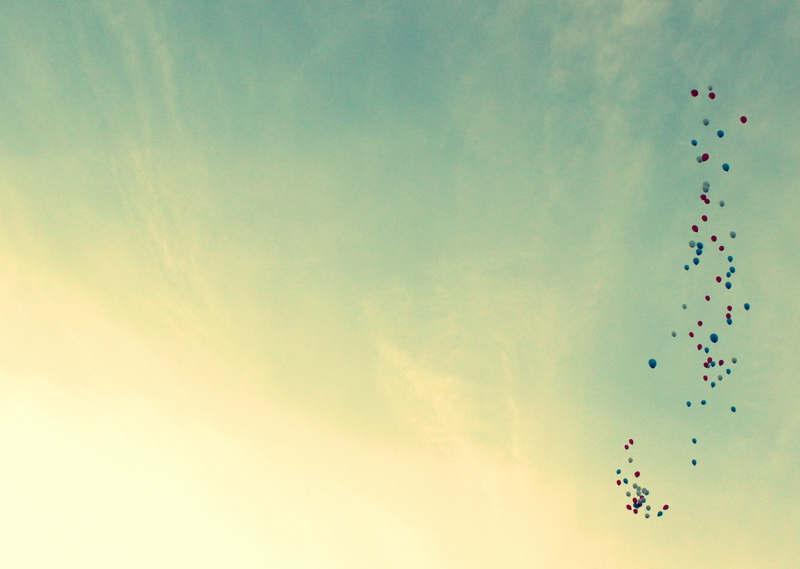 We can’t hold on to balloons forever, after all. Eventually we’ll have to let them go. Isn’t it enough to hold on to them for just a moment and then enjoy the sight of them soaring towards the stars? And that moment, this year, these students – all the growing pains – they’ve all been worth it. This entry was tagged balloons, Czech Republic, growing pains, life, Prague, school, summer, teaching. Bookmark the permalink.